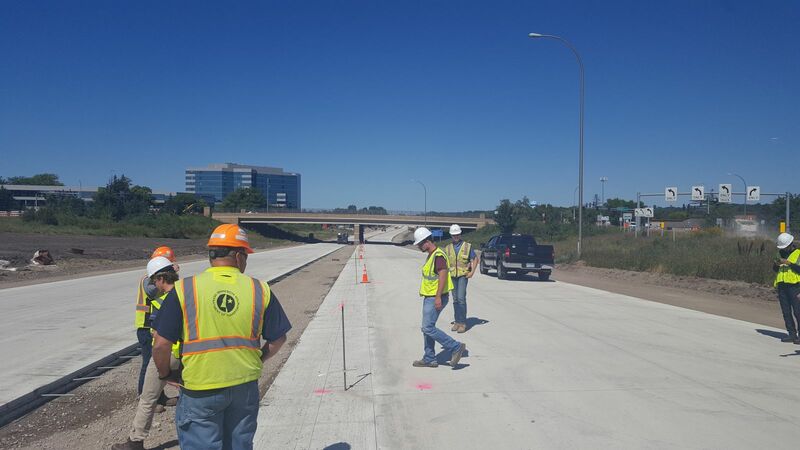 Six students with the APWA-MN Student Chapter and one of its advisers, Cody, were led by Curt Callio of MnDOT on a tour of an almost-completed highway reconstruction project. The particular area has a history of different construction challenges, including inundated soil and a sensitive wetland. The solution Alliant Engineering dreamed up involved pouring deep pilings and using the crushed concrete from the old bridge as a stable bed for a causeway. Nine Mile Creek was diverted under the road via a box culvert and the horizontal footprint of the causeway was minimized by unique, non-load-bearing retaining walls and moment-cancelling, L-shaped collision barriers. 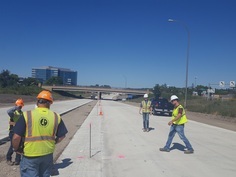 The Student Chapter’s thanks go out to MnDOT and their willingness to let us visit this unique feat of engineering.